More standard features in the 2017 and the 2018 Hyundai Santa Fe Sport mean more fun for you and your family. Hyundai has added equipment and made some design changes for these model years. The 2017 Hyundai Santa Fe Sport is resplendent in its redesigned skin. With a restyled front and rear end, it has a more aggressive appearance than before and looks more willing to take on tough vacation and travel adventures. The new taillights and headlights, along with daytime running LED lights, make you visible during all weather conditions. The front bumper is a bit sharper and fiercer than previous years, and the wider grille lets your Santa Fe breathe in big gulps of fresh air as you tackle the backroads to the highest mountain tops. Dual exhaust pipes and new wheel designs round out the exterior changes. 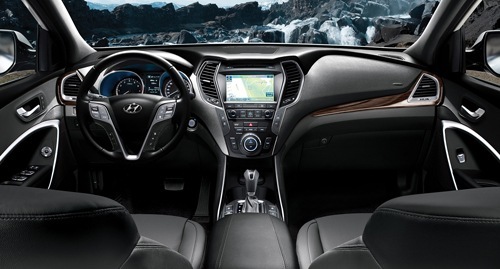 Hyundai offers you better control over your fuel efficiency by giving you a drive selector. You can choose between Normal, ECO and Sport depending on your driving conditions. No matter which mode you need, the select system adjusts the steering effort and throttle response to deliver the desired results. Normal is for everyday driving, Sport is for taking on the big highway curves and ECO is for saving fuel. In addition to choosing your drive mode, you have a choice between the 2.4L GDI engine and the 2.0L twin scroll turbo. Either choice will deliver power to the agile Santa Fe Sport. For even more adventure, choose the AWD system with 3,500 lbs of towing capacity. This package will get everyone to the mountain lake getaway in comfort and style. There are a number of trim packages to choose from in the 2017 models, but the 2018 models have been reduced to three as Hyundai combined some of the previously optional packages into more feature-rich trims for the 2018 SUVs. This did away with the mid-range packages for the 2018 lineup. Features like Apple CarPlay, as well as other options, are now standard rather than individual trim choices. There is ample room in the Sport for everyone and everything. You can comfortably seat five, and the second row is built with a 40/20/40 split that lets you slide in longer cargo like golf bags or hockey sticks and still leave two rear passenger seats available. In some models, the centre rear seat can be equipped with a sliding feature that lets you pull a child closer to the front seats, thus eliminating the need to stop the vehicle and get out when you need to tend to an infant or child in a child seat. You get a lot of space in the back, including a hidden compartment under the rear floor capable of hiding away 51 litres of cargo you want out of sight. It’s a great place to hide holiday gifts. An available Smart Power Liftgate makes stowing away groceries or other items a lot easier. As long as you have the available proximity key in your pocket or purse and stand three feet behind the liftgate for more than three seconds, it will magically open up for you. It won’t put your groceries away when you get home, but it will make loading and unloading them convenient. Since there are so many safety features built into the 2017 and the 2018 Hyundai Santa Fe, you must experience them in person. Features like Autonomous Braking with Pedestrian Detection and Lane Departure Warning must be experienced. Stop by and see us today, and we will show you all of the safety features that Hyundai built into the 2017 and 2018 Santa Fe, as well as all the accessories that make this truly an adventurous SUV.